I haven't done one of these updates in a while. I slowed a bit while I was writing my dissertation (also it was cold and I do not really want to run in snow or on ice) but never gave up! Recently I have been getting serious again, running a long trip (usually 13–17 miles) almost every weekend. These long ones are basically a necessity now, since it's a (say) 7 mile minimum trip just to get to (say) downtown and back, and that's on roads I've already done! Long is fun, though. I'd like to be able to run a marathon this year, and if I can find some solution to this knee pain that comes on at like mile 15, I think it is within my grasp. So if you flip between this and my first post on the subject you can see my progress in 11 months. Not too shabby. (In that post I claim knee pain after 10 miles. Maybe it is getting stronger then?) 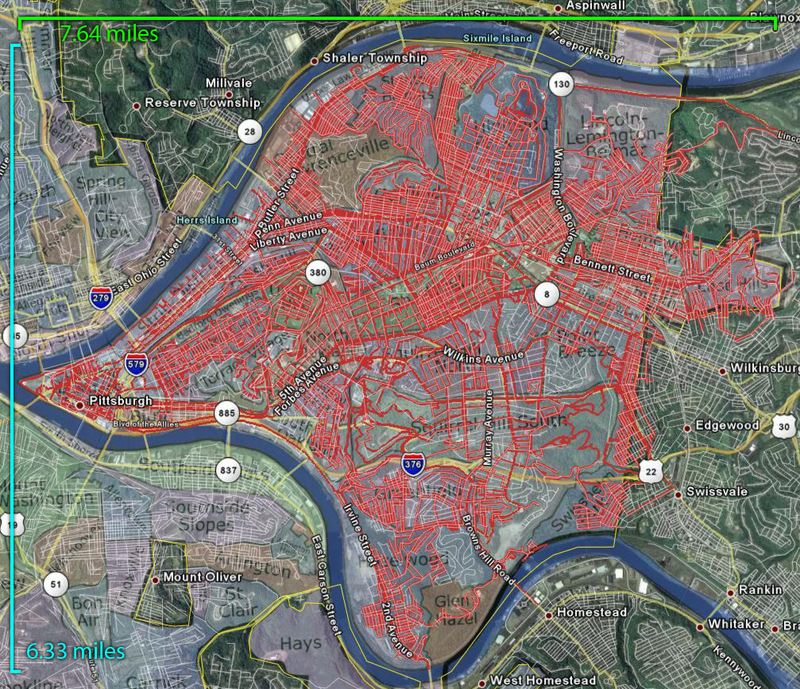 I like how the network of routes diverge like blood vessels from my apartment in Shadyside. Some numbers: I've run 1533.5 miles total in 8 days, 18 hours, 51 minutes. Certainly not all of that is for Pac Tom, but most is. I think I have gone through 5 pairs of sneakers since starting ($620! ).